The European Space Agency’s Rosetta mission is currently exploring comet 67P/Churyumov-Gerasimenko, returning incredible views of this tiny frozen world. The Rosetta mission is a hugely ambitious endeavour – the first spacecraft to orbit a comet and follow it on its journey towards the Sun, accompanied by its lander, Philae, which made the first ever landing on a comet in November 2014. Observatories across the planet are supporting this mission, and the ING is playing an important part in this – especially in providing unique observations this year as the comet passed its closest point to the Sun and highest level of activity. One of the key goals of the ground-based observation campaign that supports Rosetta is to understand the comet on the largest scales (the coma fills a volume tens of thousands of km across) while the spacecraft explores the very inner region (normally within 300 km of the 4 km long nucleus). To do this, observations need to look at both the shape of the coma via wide field imaging and the chemical composition of the coma gases. The gases reflect sunlight at different wavelengths, allowing them to be identified and measured using spectrograph instruments. The Isaac Newton Telescope (INT) Wide Field Camera returns particularly sensitive images of the coma and tails of the comet. 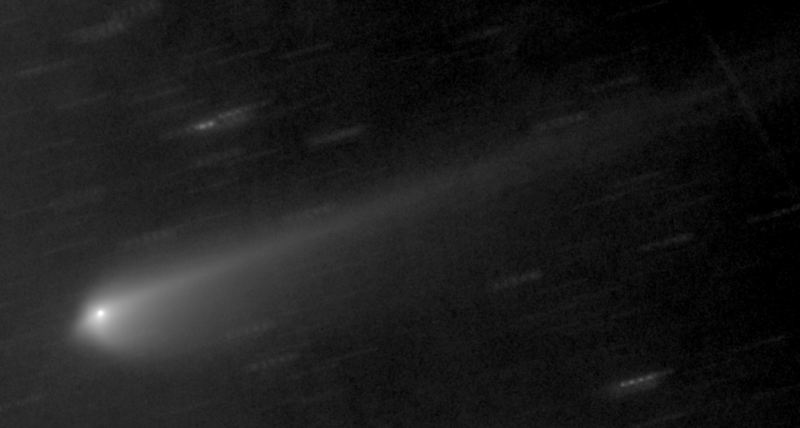 In the image above, taken in the morning of the 14th of October 2015, the comet’s tail can be seen stretching across the field, a distance of over 800,000 km. The image shows only part of one chip of the four in the WFC array. Figure 1. INT/WFC image of comet 67P/Churyumov-Gerasimenko obtained on 14th October 2015. [ PNG ]. Now that the comet is relatively bright, many spectrograph-equipped telescopes are being used to measure the composition of the coma and the relative production rates of gases, but the William Herschel Telescope (WHT) has a unique capability in observing comets: high sensitivity to blue and even near ultraviolet (UV) wavelengths. The ISIS spectrograph on the WHT is sensitive to blue and near-UV wavelengths of light, where there is a very strong cometary emission from OH. This is created by water molecules being split by solar UV radiation, and so there is a lot of it released by comets. Figure 2. 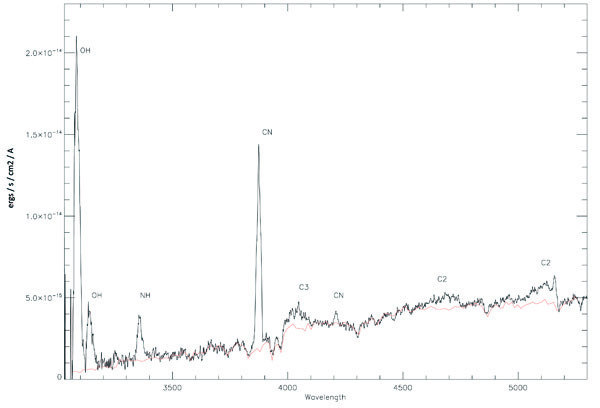 10-minute spectrum of Comet 67P/Churyumov-Gerasimenko using the William Herschel Telescope on 20 August 2015. The red line shows the solar spectrum coming from sunlight reflected by the dust grains in the coma. Credits: Alan Fitzsimmons et al. [ JPEG ]. This band is difficult to observe from the ground because UV radiation is absorbed by ozone in the Earth’s atmosphere (a good thing, since UV light is harmful). It has been even more difficult in the case of 67P/Churyumov-Gerasimenko as the comet could only be observed low in the sky in twilight. This means that the line of sight to the comet passes through even more of the atmosphere – in astronomical terms, the observations were taken at high airmass – effectively doubling the absorption of UV light. These challenges meant that detecting OH was not possible elsewhere, but was theoretically possible with the WHT and ISIS. Thus the WHT was used to observe 67P/Churyumov-Gerasimenko for an international team led by Colin Snodgrass (Open University) and Alan Fitzsimmons (Queen's University Belfast) in the early morning twilight of the 20 August and again on 2 September. Even though only 3% of the UV light from the OH molecules made it through the atmosphere, there was enough water being released by the comet that ISIS made a clear detection of this gas. The spectrum above has been corrected for the absorption caused by the atmosphere and instrumental effects, to show the true amounts of light reaching the Earth. This can be compared with direct measurements from Rosetta: The MIRO instrument onboard Rosetta measured the comet to be releasing up to 300 kg of water per second around perihelion, whereas the Earth-based observations gave 90 kg per second. Given the variability in the amount of gas being released from the comet and uncertainties in the physical models applied to the data, these results can be considered consistent. The numbers will probably move closer as the scientists refine their models by combining both sets of data. And what about that CN (cyanide) gas? Through a quirk of quantum physics, it is much better at scattering light from the Sun than OH. So even though that emission was almost as bright as the OH, it was due to only 0.13 kg of HCN being released per second from the nucleus, before the HCN molecules break apart (dissociated) to form the CN we see from Earth. Along with all the other gases in the spectrum such as C2, C3 and CH, the ground based data give a good view of some of the constituents of the coma of 67P/Churyumov-Gerasimenko at distances beyond the unique vantage point of Rosetta.